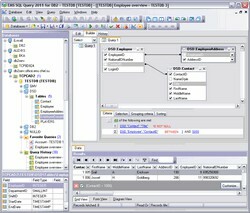 EMS SQL Query for DB2 is a useful tool that lets you quickly and simply build SQL queries to IBM DB2 databases. Visual DB2 query building as well as direct editing of a query text is available. User-friendly graphical interface allows you to connect to DB2 databases, select tables and fields for a query to DB2 server, set the selection criteria and much more. Using this query utility you can work with several DB2 queries at once, etc.